Specialty advertising pieces such as pens, mail openers, keychains, or calendars are an effective, affordable way to get your name out.Click on the above link to view our advertising specialty and promotional products site. Click on the above link to view our all occasion card collection for business. 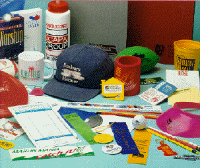 We can supply your company with all types of apparel & accessories. We also handle all of your embroidery and silk screening needs to enhance your corporate image. Click on the above link to view our apparel selection. 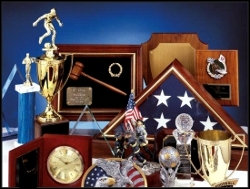 Business, Academic, and Sports Awards We now offer engraving for plaques, trophies, and various other awards. The Difference between "nice" and "wow"
Full Color Imaging directly on CDs/DVDs! Duplicate: Presentations, Seminars, Manuals, Training Materials, Videos even your favorite Photo CDs. We can produce presentation folders in any color or size. 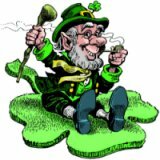 These can be printed in a single or multiple colors of ink, even four color process. Embossing and foil stamping will create a lasting impression. Additional options include business card slits and printed pockets. We can create a memorable image for your wedding with invitations, reception cards, wedding programs, napkins, and much more. Click on the above link to view our wedding invitations site.